I can't decide what is more tasteless. 1. President Asif Ali Zardari of Pakistan telling Sarah Palin how gorgeous she is in real life and threatening her with a hug. 2. 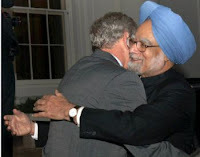 Or Prime Minister Manmohan Singh telling President George W. Bush "the people of India deeply love you". At least Zardari's leching conforms to what is considered "normal" for his gender (though certainly not his political position). (You can see the clip on youtube). But Manmohan professed his luhv after Bush and his administration essentially punched him in the solar plexus on fuel supply assurances and reprocessing consent in the 123 agreement. Strange way he chose to convey the country's unhappiness. And that's leaving aside all of Bush's other sins, too numerous and major to bear recounting here. Nation has to pay for decades for this deal; & surprisingly [?] Mamohan is not bothered! And why so anti-love? As Veerappa Moily said " if someone says I love you, is it a bad thing?!" Moily said that? You're kidding me, right?